Coin Flip Cemetery Bomb is rather useless, non? With the mass amounts of removal out, yes, you will have a chance to do hefty amounts of damage to your opponent, but most of the time, your average deck is running a BLS. And wishes they were running three. This should not be a source of burn power for a burn deck. At most, you're doing 1600 damage, and you can easily match that with one Just Desserts. I won't say it's entirely useless, but there are better cards to use for the same goal. Sorry for the short review, but there is not much to say about this card. Cemetery Bomb is an interesting card, often underlooked, seldom played. It has a lot of potential however. CB is a Normal Trap, and it is chainable, which is a plus; but the effect is such that you probably won't want to activate it until mid-to-late game, which is a downside. Nevertheless, it's a good card, much better than its more-restricted-in-its-use cousin, Blasting the Ruins. 100 damage for each card in your opponent's Graveyard admittedly doesn't seem like a lot, and most of the time it isn't; after all, it takes 1/4 of your opponent's Deck in order to make this card do 1000 damage. Barely worth it, right? Well, that argument could be made, but there are ways to get cards into your opponent's Graveyard faster. Try running Cemetery Bomb in a Deck-Destruction Deck. With 20-30 cards in your opponent's Graveyard, Cemetery Bomb becomes pure evil. Add that to the fact that Warrior is a big theme right now, and Warriors focus on speed, and speed equates to more cards in the GY, and Cemetery Bomb gets even better. Is it for all Decks? No. Is it for all Burn Decks? No. Is it for a decent number of Burn Decks? Meh...maybe. But there are several Decks where Cemetery Bomb is a great addition, and you should consider running it if for no other reason than to be rentsy and make your opponent regret all that Deck speed. Today’s card is Cemetery Bomb, a card that is misspelled on the card itself (Cemetary Bomb). Effect: Cemetery Bomb is a Trap card with a simple effect; it does damage to your opponent’s Life Points x 100 for every card in their Graveyard. Use the effect late in the game or when your opponent has at least 10 cards in their Graveyard and you can do a fair amount of damage. Effect – Pretty Good. Combos: Not a great deal of ‘combos’ with Cemetery Bomb, and they aren’t necessary. Using Cemetery Bomb successfully only requires time to pass. Usability: Cemetery Bomb can work in your standard Burn Deck with ease, and it can work in other decks as well. Cemetery Bomb is a solid card that isn’t tied down to a few decks. Its only problem is finding room for it in your deck, considering you have a need for it. Advanced Format: 2/5. Find room for it and you now have a pretty good card. Traditional Format: 2.5/5. Chaos Emperor Dragon puts large amounts of cards into the Graveyard in a short period of time, and because he’s widely played in Traditional, Cemetery Bomb’s success rate goes up. Art: 1/5. There wasn’t much time spent on the artwork by the looks of it. Another card that can work well in deck-destruction, or a good late-game burner. The damage isn't that much until at least mid-game, or if the opponent has already used Painful Choice, Graceful Charity (in Traditional), or if you've used Card Destruction. I really don't have a lot to say about this card -- except there's one other use for it, which is in the side deck of a deck whose goal is to tie every game. Tuesday brings us another burner-themed card; this one is Cemetery Bomb, and as its name suggests, it’s intended for use with your opponent’s graveyard. Dump a bunch of cards in her graveyard (or wait for the natural course of things) and voila! one card can unload 2000+ points of damage. Let’s do some simple mathematics though; most duels do not go past 20 draw phases, and even with dumps such as Painful Choice, you’re going to have to “speed” up the situation, perhaps mixing this card up with studs such as Card Destruction and Morphing Jar. Burners have no problem running either of those cards, since new hands= new options. 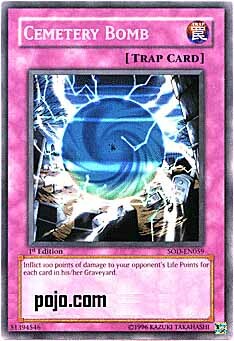 Cemetery Bomb should enter decks that have resources devoted to manipulating your opponent’s graveyard; it can do loads of damage, but it’s going to need help. Let’s see how it rates in such a deck. Advantage F/H: I’m going to assign a baseline damage rating of about 1000 with this card. Early game, you can figure to do about 300-700 damage; midgame, about 1000-1500; endgame, upwards of 2000 plus. One card for 1000 damage, on average, isn’t bad, but let’s not forget Delinquent Duo cost 1000 to dump one of your opponent’s cards, and it was one of the best ever. This basically means that one card is generally worth more than 1000 life points, making this one’s advantage slightly dubious. Best Draw for the Situation: In the later stages of the game, this card is devastating because it can unload 2000+ damage to your opponent. Unfortunately, when your opponent only has 5-10 cards in his graveyard, this card loses a lot of effectiveness and can become dead weight. Attributes/Effect: Let’s compare this card to other tools in the burner’s arsenal. Solar Flare creates steady 500 damage per turn, and is a 1600 attack monster. Lava Golem does 1000 per turn, as does Wave Motion Cannon and Stealth Bird. For traps, ceasefire will do upwards of 2000 if used correctly, so we begin to see that there are far better options in the burn deck than this one. While it can shine in certain situations (namely, the end game), it’s not exactly stellar deck material. Dependability: Burn decks rely on doing lots of life point damage, and fast. This card is counter-intuitive, because it depends on waiting long amounts of time to get your opponent’s graveyard nice and meaty. As it stands, it’s not dependable in the early stretches of the game, and 100 per card is rather paltry. The Bottom Line: There are better options than this one. Cards it functions well with: Standard burn themed cards, Card Destruction, Morphing Jar, Morphing Jar #2 and other graveyard dump cards.